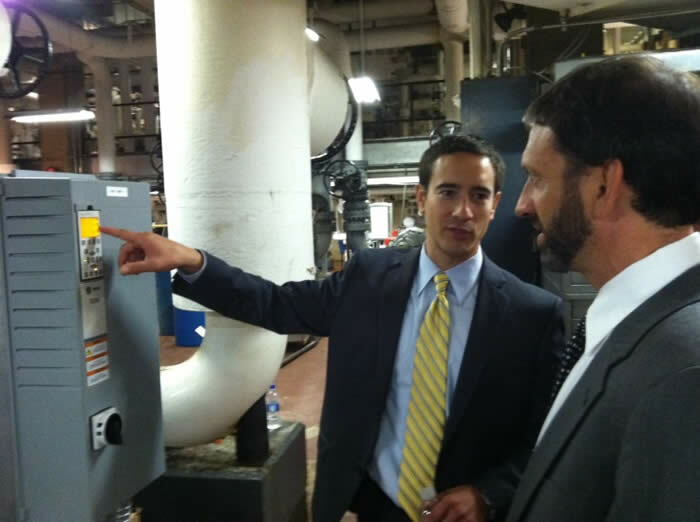 Doug Edwards, account manager with Seiberlich Trane, explains to MEA Director Malcolm Woolf how a variable frequency drive located several floors below ground optimizes building systems throughout One North Charles. After installing $1 million worth of energy efficiency upgrades, Seiberlich Traneacknowledged the One North Charles high-rise in downtown Baltimore with a “High Performance Building Award.” The aging office building had been in need of improvements for some time, and the Maryland Energy Administration (MEA) helped make the project possible by providing the Buccini/Pollin development group with a $600,000 low-interest loan. During the day, the office’s sunny side would get up to 30 degrees warmer than the rest of the building. Upgrading the 50 year old ventilation system remedied these temperature differences, and improved the building’s comfort. Buccini/Pollin expects the improvements to save the company $300,000 a year in energy costs. Doug Edwards, the projects account manager, noted that energy efficiency upgrades are one of the few ways that real estate developers like Buccini/Pollin can generate more income from their buildings. Buccini/Pollin also installed energy efficient lighting, upgraded their air conditioning, and put in a new system to monitor energy usage. These energy efficiency savings qualified the building for rebates from the company’s electric utility, Baltimore Gas and Electric. MEA’s director hopes that other companies will use state and utility incentives to upgrade their own offices. “With $2.5 million available for loans over the next year, we’re working to tell the One North Charles success story far and wide to help other businesses understand the benefits of investing in energy efficiency,” Woolf said. 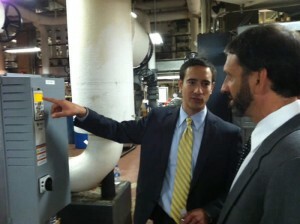 MEA’s loan to Buccini/Pollin came from its Jane E. Lawton Conservation Loan Program, which provides businesses, eligible non-profit organizations (including hospitals and private schools), and local governments (including public school systems and community colleges) in Maryland with a unique opportunity to reduce operating expenses by identifying and installing energy conservation improvements. The program honors the late Delegate Jane E. Lawton for her dedication to Maryland’s environment and energy efficiency.